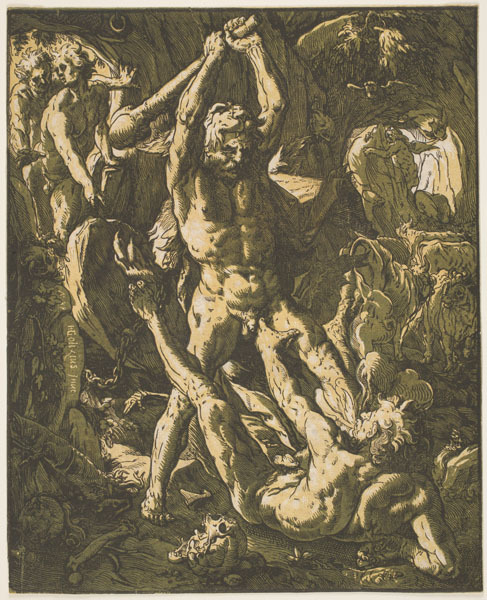 This image shows one of many legends of the exploits of Hercules, the most famous hero of ancient mythology, who vanquished supernatural foes with his great strength and courage. On one occasion, driving his herd through Latium, the region where Rome would one day be established, Hercules stopped to nap on the bank of the Tiber river. While he slept Cacus, a fire-breathing monster who terrorized the countryside, stole the cattle, dragging them backward by their tails into his cave. When the hero awoke he followed the animals' lowing to the demon's lair, where he killed Cacus. A prolific draftsman and painter and an engraver of unmatched virtuosity, Goltzius was the most successful printmaker of the Mannerist period in the Netherlands. He designed the chiaroscuro woodcuts produced in his shop in Haarlem, which were probably made by other craftsmen in his employ. Using several carved blocks of wood to print different tones of color, the artist simulated the effect of a pen drawing heightened with wash.